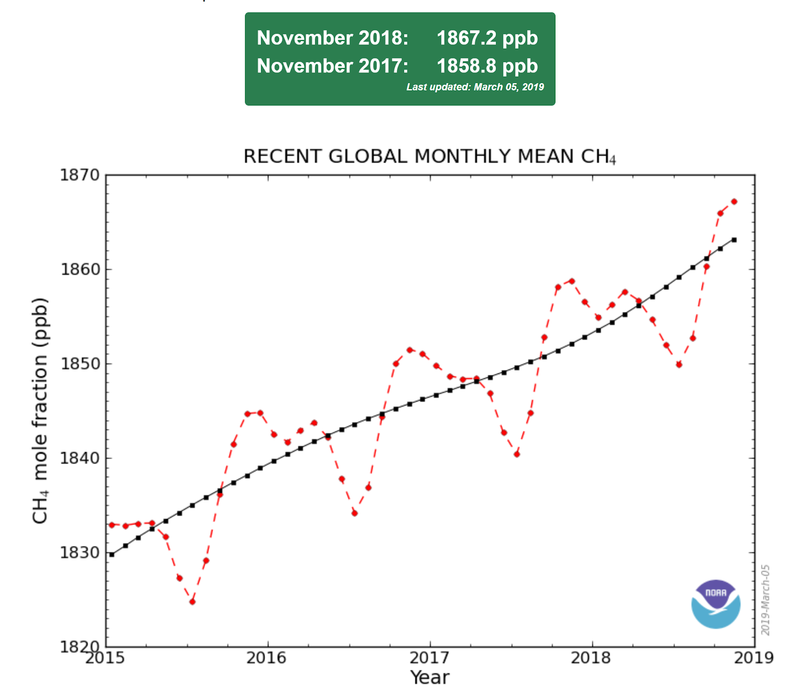 According to the NOAA ESRL latest monthly data release, November, 2018 saw the planet experience a global methane mean of 1867.2 ppb, an increase of 8.4 ppb over 2017. During the past five years we have experienced an increase of 46.8 ppb, and in the last 10 years, a 69.8 ppb increase. As recently reported, the science community is still determining the mix of sources driving this increase since 2007, and the acceleration since 2014. What has been proposed are changes in biological sources such as emissions from cattle, a drop in hydroxyls in the atmosphere which impact the length of time before methane breaks down, or agricultural production that is increasing methane emissions, particularly from rice production. A final source suggested is an increase in methane released by new natural gas and oil production. Of significant concern is that natural feedbacks may begin or increase. If this occurs - despite cuts in human emissions - natural sources will offset our cuts and lead to future climate change. 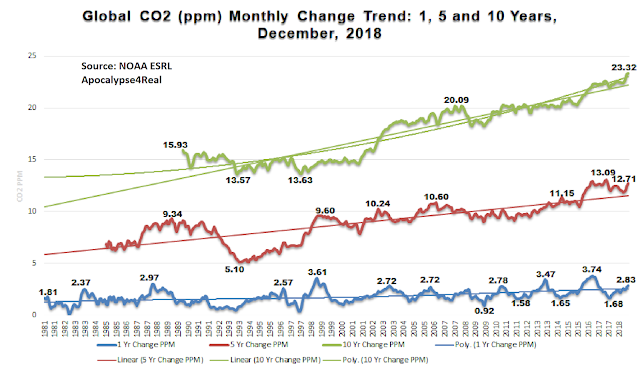 In December, 2018, NOAA/ESRL reported global carbon dioxide at 409.36 ppm, or 2.83 ppm above December, 2017. That annual change was the highest since those associated with the 2015-2016 El Nino, when the world experienced increases above 3 ppm for 12 consecutive months. This month continues the unbroken CO2 concentration rise observed at Mauna Loa since 1959, then globally since 1980. When December, 2018 is compared to 2013, global carbon dioxide has increased 12.71 ppm, the highest five year change since July, 2017 when we experienced a five year increase of 13.09 ppm. 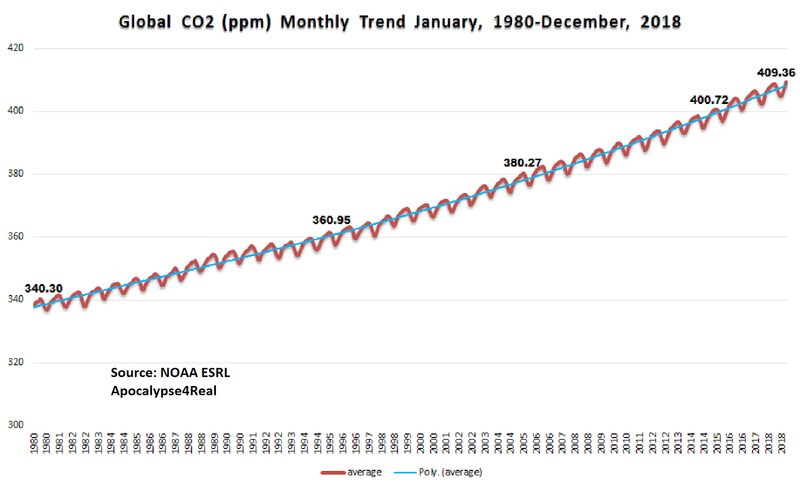 The last three months have experienced a decadal change above 23 ppm, with December having the highest at 23.32 ppm. 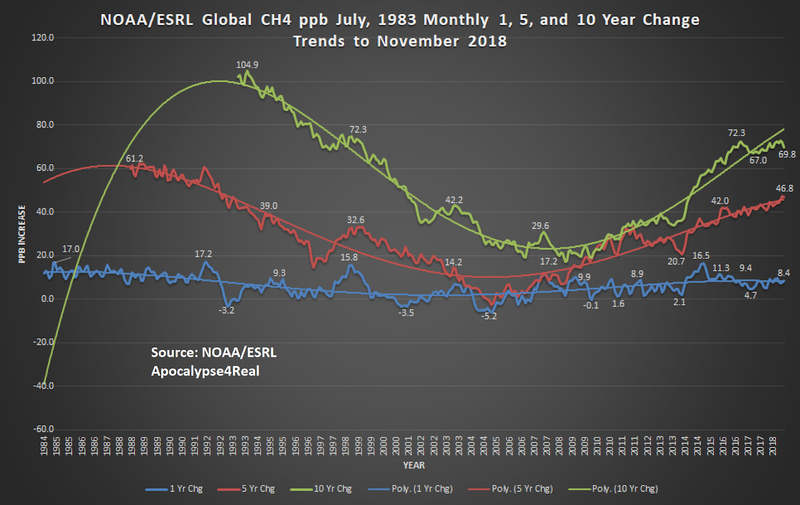 The five and ten year rates continue trends which reflect ever increasing global emissions at increasing rates of change. 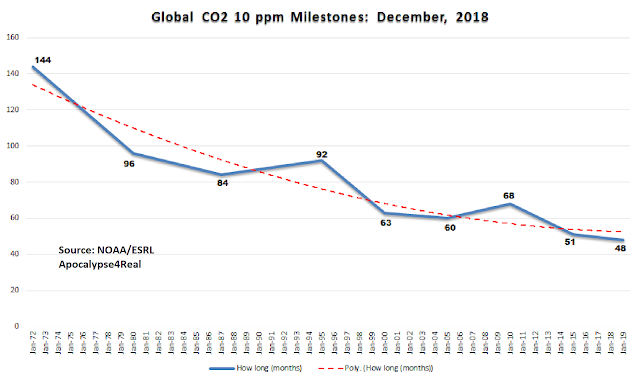 The world is on track to pass 410 ppm in 2019. It is possible this will be reached in February, quite probable in March, and almost certain in April, 2019. It is also probable that the global concentration will exceed 411 ppm in April or May 2019, given historical changes of 2+ ppm between December and April/May in recent previous years. Of greater concern is reaching 10 ppm increases in shorter times. 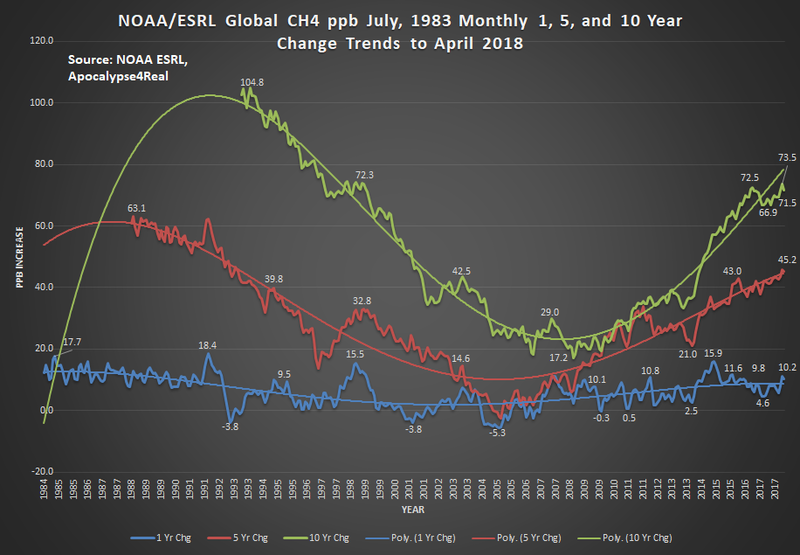 If we pass 410 ppm in March, 2019, it will be only 48 months after passing 400 ppm in March, 2015. To increase from 320 to 330 ppm took 12 years (May 1960 to May 1972). 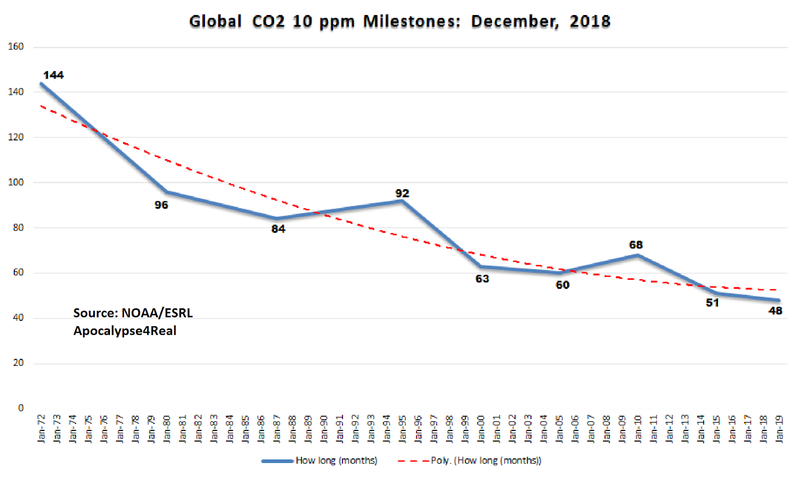 We are now blowing through these 10 ppm milestones in 1/3 the time. If we stabilize carbon dioxide concentration increases for each future 10 ppm at 48 months, the planet will experience a doubling of CO2 compared to pre-industrial by 2080 and over 610 ppm by 2100. However, given that emissions are not slowing, combined with potential environmental system feedbacks, we may reach 560 ppm sooner, with less ability to influence the trend with decreasing emissions. More on this in another post. Over the past few weeks US news has covered fires in the West; in California, Nevada, Oregon, New Mexico and Arizona They have burned millions of acres of forests, grassland, grazing land and most sadly, wheat crops ready for harvest in Oregon. Some fires are still burning and threaten homes, towns and livelihoods. Here is a snapshot of US and Canadian fires and smoke from the NOAA EOSDIS Worldview for July 20th. A click on the image or a visit to NOAA EOSDIS Worldview reveals the US and Canadian fires as red dots in the VIIRS imagery. But how does this compare to the rest of the world? The media has reported on fires in Sweden and Finland over the last few days, with as many as 60 forest fires burning in Sweden and dozens in Finland. What has not been reported are the Russian fires burning in the Kola Peninsula and Western Russia, many well above the Arctic Circle. So what else is not being reported? Fires are burning in Indonesia and Australia, with the Indonesian fires potentially signalling a return of deforestation for more palm oil plantations. These fires cause smoke and haze to cover Malaysia and cause significant health hazards. Australia's fires may relate to drought conditions in its north. Amazon rainforest and savannah fires are are creating ongoing loss of habitat and biodiversity as agricultural interests destroy significant swathes of rainforest and open savannah areas. Fires in eastern Brazil, and the loss of forest in these areas is bringing the country closer to a tipping point in which forest loss leads to irreversible change in its climate. "According to Carlos Nobre, a Brazilian scientist and expert on climate change, we’ve already deforested about 18 percent of the Amazon. Reaching 20 to 25 percent deforestation would cause the “system to flip to non-forest ecosystems in eastern, southern and central Amazonia,” he wrote with Thomas Lovejoy in a recent paper in Science Advances." In most tropical regions, demand for soy, beef, palm oil, and other commodities — as well as fires — is driving the bulk of deforestation. In Brazil, which lost 11 million acres of forest cover in 2017, the main use for cleared land is cattle pasture." The brown areas in eastern Brazil represent areas undergoing long term drought and change in temperature, that are shifting the climate as deforestation occurs. The SPEI Global Drought Index 48 month base displays the tragic truth. Almost nothing is reported on African forest and savanna fire impact in the Western media. Much of the African forest fire activity is related to agricultural production. As Global Forest Watch reported, "Tree cover loss in the Democratic Republic of Congo (DRC) reached a record high in 2017, increasing 6 percent from 2016. Agriculture, artisanal logging and charcoal production drove the tree cover loss, with nearly 70 percent of it occurring in agricultural areas known as the rural complex." However, like Brazil, if the global community does not work with central Africa, especially the Democratic Republic of the Congo, to slow charcoal fire use and deforestation, the world may lose another major carbon sink to becoming a carbon source. Massive and pervasive forest, peat and permafrost fires have burned in central and Siberian Russia since April. After initial reporting in April and May, the media in Russia went silent and Western media is not focused on the story, except when plumes of smoke cross the Arctic into Canada and then New England. While the global community talks about deforestation in the tropics, deforestation by Russia deliberately not fighting these fires needs to be considered. However, it is so dry that it is almost impossible to do so on this large scale. The SPEI Global Drought Monitor makes this dilemma apparent. Some portions of central and Siberian Russia have experienced comparative high heat and deep drought for the last four years. as part of a decline that began in 2010. While these torched areas may grow back, in some areas it will take a century or more for full restoration. In some cases because of the scale of what is destroyed, the forest may not return. But megatons of soot, ash and carbon monoxide are being released by these fires at high concentrations. Carbon monoxide concentrations in some areas are above 4800 ppbv. These fires and resulting emissions are making it more challenging for the world to make progress in meeting a future 1.5 or 2C goal set in the Paris Climate Agreement. On July 5th, NOAA ESRL released the preliminary April 2018 global mean CH4 concentration. This month's concentration reached 1858 ppb, which is 10.2 ppb above April, 2017. It is also the second consecutive month with increases above 10 ppb, since June, 2016. What is troublingly different is that June 2016's increase was still associated with the 2015-2016 El Nino. The March and April 2018 increases are not. Whether these remain as double digit increases will become clear over the next several months as additional site samples are submitted and tested. If they do, what is significant is that this increase of global methane emissions will be most likely be primarily from anthropogenic sources. The April 2018 global mean concentration is 13 percent higher than April, 1984. We also are potentially observing an ongoing acceleration of CH4 increase in the atmosphere. The five and ten year trends of CH4 mean concentration change reveal this global acceleration. 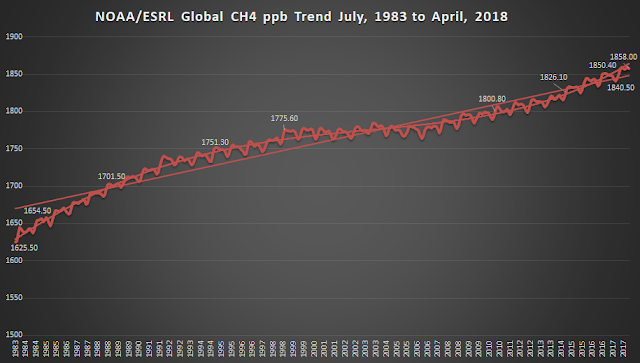 The April 2018 mean of 1858 ppb is 45.2 ppb above the same month in 2013. This is the second highest five year change, and is the 12th consecutive month of a five year change in concentration above 40 ppb. The CH4 mean concentration change since April 2008 is 71.5 ppb. This is the third month in a row of a decadal concentration change above 70 ppb. Again, it is troubling that the only other time we have experienced a ten year change above 70 ppb was in response to the 2015-2016 strong El Nino. This time there is no El Nino affecting this methane increase. With increases in global natural gas production, increasing fire emissions, and permafrost warming in the Arctic, it is quite likely that this trend will continue into the foreseeable future.